A survey of peer-reviewed scientific papers published in 2016 and using data from ESO’s telescopes and instruments has shown that ESO remains the world’s most productive ground-based observatory. Astronomers used observational data from ESO facilities to produce an all-time high of 936 refereed papers last year. There were 565 papers credited to ESO in 2016 that used data acquired with either the Very Large Telescope (VLT) or the VLT Interferometer facilities on Cerro Paranal. The three most productive VLT instruments in terms of papers are UVES, FORS2 and VIMOS, which featured in 123, 109 and 75 papers, respectively. The MUSE and SPHERE instruments also saw large increases from the previous year. Data from the VISTA and VST survey telescopes on Cerro Paranal led to 93 and 18 papers, respectively. Facilities located at La Silla provided data for almost 200 papers in total. HARPS remains La Silla’s most productive instrument, with 80 papers to its name. European observing time with the Atacama Large Millimeter/submillimeter Array (ALMA) accounted for 129 papers in 2016, bringing to 305 the total number of such papers by the end of 2016. Observations made with the Atacama Pathfinder Experiment telescope (APEX) in ESO-APEX observing time led to 46 papers in 2016, taking the total of such papers to 301 by the end of 2016. 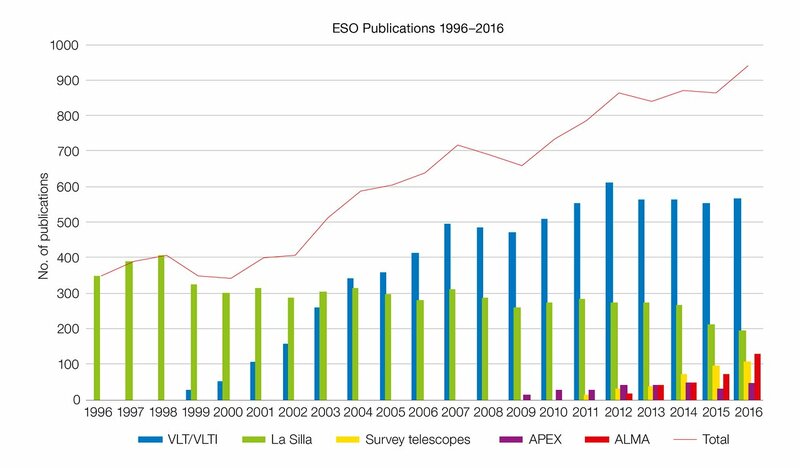 The continued success of ALMA and APEX contributed significantly to ESO’s record-high number of publications. APEX is a collaboration between the Max Planck Institute for Radio Astronomy, the Onsala Space Observatory and ESO, and is operated by ESO on the Chajnantor Plateau in Chile’s Atacama region. 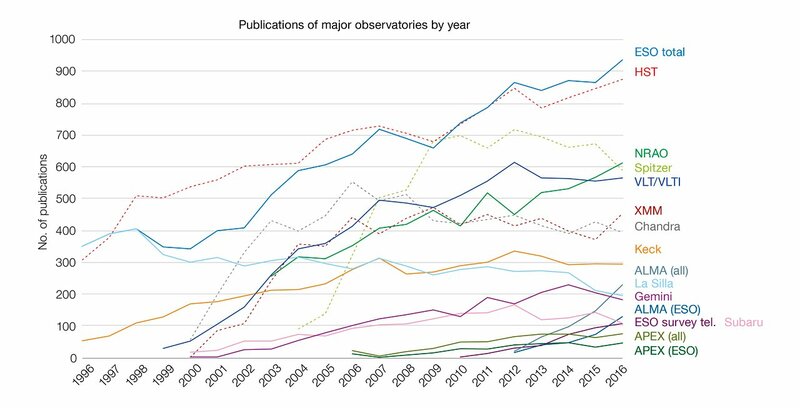 A comparison of the number of papers produced using facilities at major observatories worldwide puts ESO’s observatories at the top of the list. Note that the methods used to obtain these numbers differ from one observatory to another, so the figures cannot be compared precisely. Nevertheless, it is clear that ESO continues to significantly surpass any other ground-based observatory and on the available figures has increased its lead over the NASA/ESA Hubble Space Telescope since 2015. These results highlight ESO’s major contribution to astronomical research. The publication statistics give an idea of how much scientific work is carried out with data from the individual observatories, but do not address the wider impact they have on science. The figures are published in the annual Basic ESO Publication Statistics  published by ESO’s Library and calculated using the ESO Telescope Bibliography (telbib), a database containing refereed publications that use ESO data . ESO makes extensive efforts to identify all refereed papers that use ESO data and considers telbib essentially complete. In 2016, the 13 000th paper was added to telbib, published by a former ESO-Garching fellow and using data from the X-shooter and UVES instruments on the VLT . Interactive graphs of selected statistics are also available online. These graphs display the entire content of the telbib database , which contains records for publications from the year 1996 to the present. They can be used to explore many aspects of the publication history, including the development of science papers using data from ESO instruments and the use of archival data. The paper was authored by Tayyaba Zafar, who is now at the Australian Astronomical Observatory.